Comment: I looked shame in the face as I spoke my truth. And shame said, "well, if you're going to break confidentiality with me, I'm leaving." And it left. We're not friends anymore. And it's ok. I found trust, friendship and love instead. They're better friends anyway. Thank you for the opportunity to share in a safe place, Sujith. Comment: I have connected with someone from my school days and this relationship is so different from any other I have had. It is authentic and open and we are very close and I trust him. This freedom to be me is wonderful. I want to give credit to all the things I learned from you, regarding life and especially relationships. I really feel that it has made an enormous difference and I rejoice that I have been given a last opportunity to have such a fulfilling relationship. I just wanted to express my appreciation for tonight's discussion. I have been struggling the past 2 months mainly because I was not accepting my situation. Instead of accepting my situation, I was resentful of it and was not willing to learn the lessons offered. Tonight's discussion really helped me change my perception. It was what I really needed to hear. Comment: Voglio rigraziarti ancora una volta. Grazie a te sono andato oltre i miei limiti e continuerò a farlo. Voglio dare il mio aiuto a persone che hanno avuto un esperienza come la mia. Non te lo sto dicendo perché tu mi dica bravo. Te lo sto dicendo perché è grazie a te se ora so chi sono e quale è la mia missione. Tu sei un esempio per il mondo ed io parlerò a chiunque di te, affinché altri uomini possano arrivare a te ed osservare la meravigliosa anima che sei. Grazie. Comment: I didn`t know what to expect, I came to Bologna without knowing what I was doing. It was a new and strong experience for different reasons. First of all I understood that I have to check my priorities in life, they are not priorities, they are just mental paths that I oblige myself to keep on following. I also had a confirmation of a big blockage inside me, that is also making my relationship suffer a lot. But probably it`s only because a time for a change has come. I truly realized hom much I live closed in my little world and that`s why the testimonials of all the others touched me so deeply, so much that I felt pain. I really appreciated the honesty in sharing the pain of each one. I felt so insignificant... and thankful for all of this. Sujith has the great gift of listening and of giving space to each one, to make everyone comfortable, and it`s such a gift having had the chance to meet him. A day didn`t go buy in which I didn`t thought about those 3 days, everything that we said and that we claimed. It`s really helping me in my everyday life, because now I know that a different world exists. My path is still really long. January: I will make everything to be there. I send you a big hug. You are two special people. Thanks for everything. evidentemente, e' solo perché probabilmente e' arrivato il momento di attuare un cambiamento. Mi sono veramente resa conto, di quanto viva forse troppo chiusa nel mio piccolo mondo, ed e' per questo che le testimonianze degli altri mi hanno toccato così profondamente, da starci davvero male. Ho apprezzato l'onesta' nel condividere anche le sofferenze profonde. Così mi sono sentita davvero insignificante...ma grata di tutto cio'. Sujith ha il grande dono dell'ascolto e del dare spazio a tutti, e mettere le persone a proprio agio, che non posso che considerare un dono il fatto di averlo conosciuto. Non e' passato un giorno che io non abbia ripensato a quei tre giorni, e tutto quello che ci siamo detti e prefissati, mi e' di grande aiuto nella vita di tutti i giorni, perché ora so che esiste un Modo diverso! Ma di strada ne ho davvero tanta da fare. Per ora vi giunga tutta la mia gratitudine, e spero di esserci a gennaio: faro' il possibile. Vi mando un grosso abbraccio. Siete due persone speciali. per me è stato un onore essere testimone di un grande maestro, sei riuscito a smuovere tanto in me. Sono consapevole di dover lavorare ancora tanto, ma devo molto a un gran maestro e fratello che mi hai indicato la via in un momento tra i più brutti della mia vita. Ringrazio il 2014 per la tua conoscenza un abbraccio Filippo. Comment: This weekend was the single most inspiring weekend of my life so far. The insights I have gotten from all of you together have taken my awareness to a higher level, I thank you all for that. Comment: When I consider the impact that Sujith's men's pilgrimage has had on me and my ability to hold space for myself and my team, the word that comes to mind is--Pivotal. I am deeply grateful for my experiences with Sujith. Comment: Thank you Sujith for sharing and giving yourself to us; because that is what you do and i can follow your example in that. Thank you again, it was powerfull! 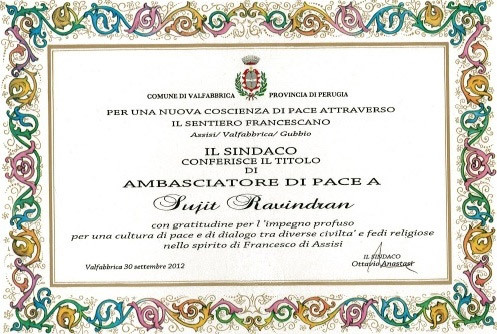 Comment: Grazie fratello Sujith Ravindran, anche se x me sei un maestro. Thanks brother Sujith Ravindran, although for me you are a master. Comment: Dear Sujith, The past year has been full of changes and learning. I hope that 2014 be another year of growth and personal improvement and also for the people close to me. It 'been a pleasure and an honor to have met you, I have learned a lot from your teachings and I often think that you were very brave (in italian "coraggioso" from the Latin cor habeo coraticum or adjective derived from the compound word cor, cordis heart and the verb habere have: I heart) to make the choice that has allowed you to take the path that you're facing. Let me wish you the best year. I miss your meditation, i hope to see it soon on your site. Comment: Dear Sujith, thank you for your wishes! I always try to increase awareness in my life and I will accept every things that the next year will send me, certainly more courageous and confident in myself after our lucky meetings. So, I have to say to you : "thank you for being in my life"!!! I hope that you will give us your wisdom and your intelligence again for many years and I wish that the new year will send you love and plenty! Comment: Thank you for being my friend, and my brother. Thank you for igniting the spark of wisdom in my heart, I am now truly happy, and nobody can stop me. I am a blessed and lucky man, already on the top of the mountain. Comment: For me it has been a memorable and unique experience, the greatest of my life. I met Sujith, a person, in my opinion so rare even if I met so many in my life. He is always ready and available for everyone, there is no time, there is no fatigue, he will always make himself available to help others. The pilgrimage of seven days that I've spent with him...you can only imagine the beauty of a walk with him and the other guys just met at the beginning of the pilgrimage, that, suddenly as a miracle they have transformed and became all like him. It’s an experience that I suggest to anyone, a path with strangers that become friends……Unforgettable! I will never stop thanking you…. Thank you Sujith and see you soon. Comment: "Which man would go on a fun trip with only men?" I thought. Now I know that this trip is not for fun. This pilgrimage is a wonderful investment in yourself. I got to know the difference between fun and happiness during this pilgrimage. I recognized the beautiful nature as part of myself. Sujith Ravindran is a master at holding a sacred space where you - together with other men - can easily and sincerely look in the mirror. Every step of the pilgrimage is worth it. The bond that I've built up with the other pilgrims is eternal, and now I cannot imagine why I ever hesitated to go. A pilgrimage is like a treasure that you discover. You realize: I am a free man, I am like a treasure. You too? Sujith, thank you for who you are. You walk your talk. Today I am starting showing gratitude. Thank you for sharing your energy and your positivism. After years of studying en teaching spirituality, I know feel that I am just in the beginning and I have to be everything I teach. Not knowing, not feeling, but being. Thank you very much. Comment: I discover my masculinity the most by making a beautiful relation with a woman. Comment: Late 2012 I was convinced by one of my daughters to join a 3 day retreat called “Mastery in Masculinity”. Yes, it took some convincing for I saw myself as a no-nonsense, down to earth , hard working manager with little or no time left to spend on something I couldn’t put my finger on. “Mastery in Masculinity” ??? …would someone dare to imply I’m not a real man…what could this be about…what is meant exactly… or maybe it’s just the next BS course ? Since I have a sound sense of curiosity I decided to participate…with an open mind…which is not as easy as it sounds for most of us are judgmental. Mea Culpa ! Being no different than the next guy, I also carry around ,suppressed, issues from my past. Of course most of them are very latent present in the subconscious and don’t influence you during your day to day business / social activities…or so you like to believe ! To me at least this specific retreat came as a sort of revelation of my inner being, providing me insight on how I became the person I am / used to be / still am up to a certain point. I gained an understanding of how events from my early childhood influence very much my decision making process ,the way I react , the kind of people I relate to ,or more plainly, what makes me tick ! Comment: Until I joined the Mastery in Masculinity retreat, I had believed that my destiny was to work a dull job until retirement and live my life arguing with my wife and daughters. The retreat made me aware of the silliness of my current life, and how I had turned myself into a teenage friend to my teenage daughters! Before the retreat, I was never aware that I can be an inspirational father figure in the lives of my daughters and the purposeful strong oak in the life of my wife. I discovered that I have a great mission in my life and that my life does not end with my death. Coming out of the retreat I feel like I am the lion of my jungle, being the loving servant of my grand mission and my family! Thank you Sujith.....I will rejoin again when you are back in Europe. Comment: Wonderful opportunity for growthful exchange and gaining a deeper understanding of how a brotherhood can help develop the mature masculine and actually apply it to real-life situations and challenges and come out smiling! All held together beautifully by Sujith's lovely energy, spiritual experience, anecdotes and big smile! Thanks again. Comment: Thank you Sujith & all the participants for a very interesting evening, full of insights. Comment: Sujith is amazing and heart-centred being. Even though the talk lasted for only a couple of hours, he managed to give everyone some profound insights into their feminine and masculine aspects. Comment: Sujith walks his talk. I can recommend him to everybody who is in search of who they are. Thank you Sujith. judgment... thank you for being my friend. about myself snoring during the meditation i start to laugh like a fool!! Thanks from the deepest of my heart to you for helping me in my searching. Full of love. Comment: I often think about your helping words: that I should start to enjoy my way and spiritual awaking! there come times where I can enjoy! I wanted to inform you about my processes that you know how much worth your work is! Comment: Mededogen is meedogenloosheid in haar ware zin; Meedogenloosheid is mededogen in haar hoogste vorm. Comment: Sujith, I can only repeat what I know to be true; A restless body reflects an agitated mind. And agitation permeates the environment. So you see what I am gifting to those around me? This journey is my grateful gift to you! "Existence has not been able to create anything higher than your mind. Its function is so complex that it baffles the greatest scientists. It manages your whole body, and it is such a complex system. Who manages that a certain part of your blood should go to the brain..."
Comment: Like Buddha said: there is no path to happiness. Happiness is the path. After a burn-out, I learned to be inspired by my own passion and being. New, endless possibilies appeared in my scope of sight. And by focussing on myself, I learned to live for other people. Thanks man! Comment: Like strange silhouettes at dawn gradually revealing their true form at the first break of day. Just so are questions of the mind often heralds of a deeper understanding. Although not yet distinguishable, they contain in their deepest reflection all elements of the answer, which will reveal itself when the time is right. A brief summary of the inspiring conversation with Sujit during our service at Dhamma Pajjota last week. Comment: Thanks Sujith for your suport. In the centre of my beeing I can find all the answers. You showed me the pad how to stay there and feel and be aware. Comment: I think whatever is going on in this world is okay, while there is always room for improvement. Hence we have the choice to exert us to the extent possible for betterment with no attachment to the final result, whether good or bad. Of course better results encourage us , but a failure should definitely serve as a pillar of success only. Comment: Being a relatively introspective person myself, I've always been amazed at your level of wisdom and your ability to inspire deep philosophical thought in others. It is furthermore encouraging to know that you practice what you preach. I'll always remember the ski trip years ago in which you were determined to learn how to snow board. Starting from scratch on day one until ultimately making it to the most difficult slopes, you somehow managed to have a smile on your face through the whole painstaking process. I can't think of a person better equiped to help and guide others. Comment: With contract negotiation being a major part of my previous job, an important objective was to find out what made the other party tick. When my responsibilities changed and moving back to NL, I started figuring out what made ME tick. And I looked for a job to match with that. Still negotiating - and a lot more. Though only for a short time now, it seems to fit great. Finding happiness in what you do makes you do things better - and it makes you happy. Comment: Wow Sujith! This is so completely and totally you. Your offering is completely authentic to who I know you to be! I am honored to be a witness to your amazing work as a Life Coach and thrilled that you are able to offer your talents in this way. Comment: Congratulations on your beautiful site, Sujith! I wish you every success as you go forward on your journey. You are a gift and a blessing to all you serve. Thank you for being the leader you are! Comment: The Western World with materialistic worries, and Eastern World with inspirational life; short term excellence and long turn vision; quick wins and sustainable future... Isnt beautiful to be so diverse? Comment: Self reflection becomes a see-through mirror when guided by the right person. Bridges cultures through coaching individuals is by itself an inspiring aim. Veel succes! Comment: Best wishes to you on such a noble and potent venture! Many of us have these questions at the back of our minds, but don't make time to reflect on them. It will be great for folks to have you as a catalyst for that reflection. Comment: Great news! This is your path, I know no other person that can make one think about oneself so much. Looking forward to see the next update of the site! Especially regarding the programs you are providing. Comment: I still remember the story of the Stone Cutter that you shared when you were in Oxford last! I found a similar story that I have stuck to my refrigerator. I felt you would love it; Two monks were washing their bowls in the river when they noticed a scorpion that was drowning. One monk immediately scooped it up and set it upon the bank. In the process he was stung. He went back to washing his bowl and again the scorpion fell in. The monk saved the scorpion and was again stung. The other monk asked him, "Friend, why do you continue to save the scorpion when you know it's nature is to sting?" "Because," the monk replied, "to save it is my nature." Comment: Such a cool project, my friend! I await your Webinar to invite folks from the West Coast. I love to share the following (from Christopher Morley) with you; "There is only one success, to be able to spend your life is your own way". Comment: I am reminded of this beautiful thought that has grown over the years of knowing you; - Self-love, my love, is not so vile a sin as self-neglect. (William Shakespeare) See you again soon. Comment: You are such a gift to those around you, and your service has been a boon to me exactly at the time when I wanted to find clarity. Thanks a heap Sujith!